One of the prerequisites of flashing a Cyanogen Mod ROM on Samsung Galaxy S GT-I9000 is that you must be on Froyo base. You need to download this single link safe Froyo base, which already contains all of the above mentioned prerequisites. Also, you will need to download the FlashingPackage.rarContains Odin3v1.3 & s1_odin_20100512.pit, the password for this file is "http://www.techgom.com/" without the quotes. Note: Make sure that you charge your Galaxy S to 100%. Check if Samsung KiesSoftware provided by Samsung to connect your Galaxy S with the PC, take backup, sync music and/or video etc. is running, exit it if it is running. Unplug the USB cable from the phone if it is still connected. Turn off the phone, by pressing the power button for a couple of seconds. Your phone will vibrate while powering down, once that is done you need to put your phone in download modePower Button + Home Button + Volume Down Button, you should be able to see this image on your phone. Now, you need to open Odin3v1.3Software used to flash firmware to your Samsung Galaxy S. from the "FlashingPackageExtracted from "FlashingPackage.rar" downloaded earlier!" folder. Ensure that you see something written in ID:COM after connecting your device. Now you have to select the PIT by selecting "s1_odin_20100512.pit512 PIT will be used while re-partitioning the device." file from the "FlashingPackageExtracted from "FlashingPackage.rar" downloaded earlier!" folder. Click on PDA in Odin and select "GT-I9000_FROYO_FULL_PDA.tarCWM + SpeedMod + safe Bootloader", this is the safe Froyo base file we downloaded earlier. DO NOT FORGET to check re-partition tab. You can now disconnect the USB cable from your phone. After successful flash, your phone is running Froyo 2.2 XXJPY with Froyo Bootloaders and Speedmod Kernel. 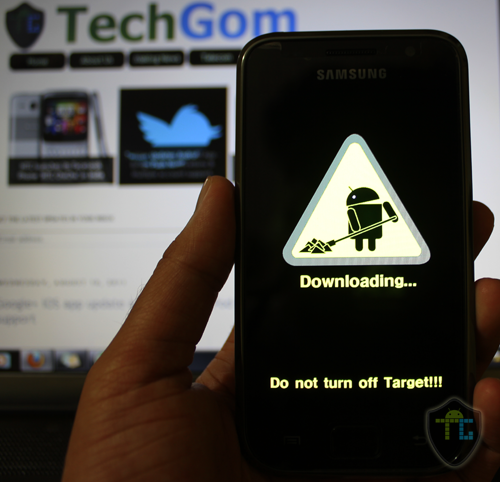 You can now install CM7CyanogenMod7 from here.